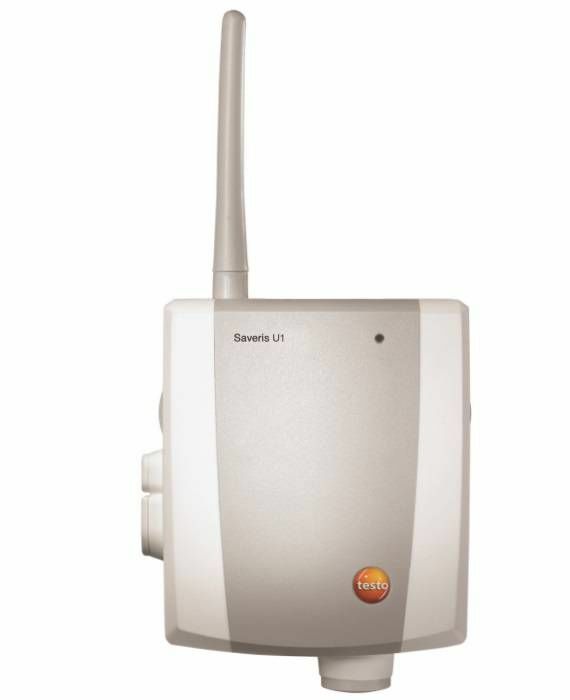 It collects measuring data from up to 150 sensors, analyzes the data and triggers an alarm if a threshold has been breached. 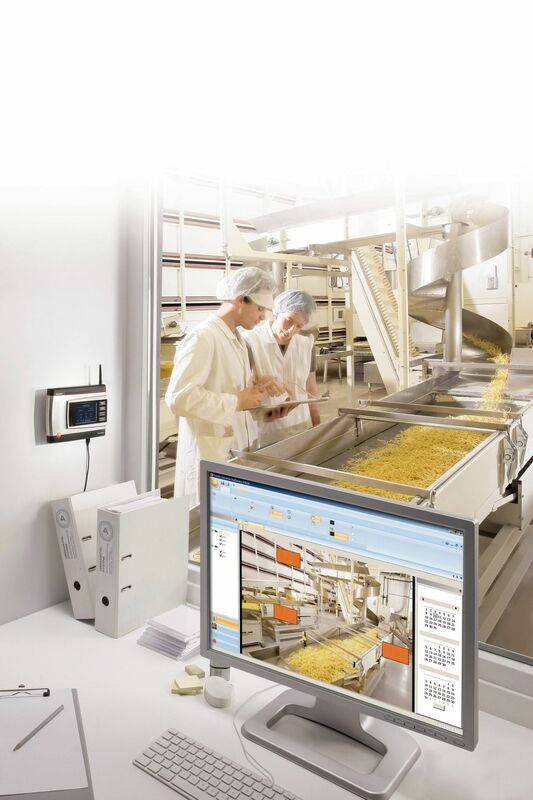 The unit can also save up to 40 000 measurements per measuring channel independently of any PC. 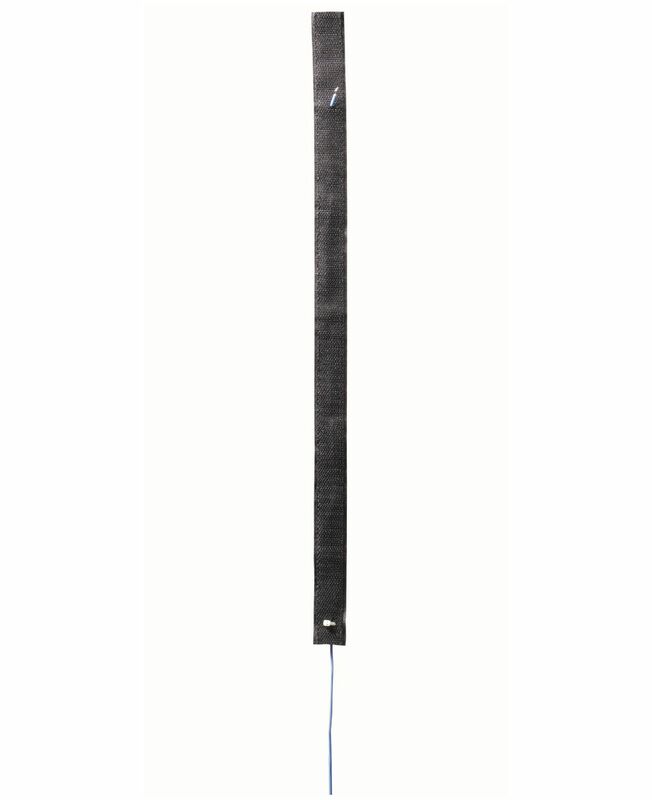 Based on a measuring rate of 15 minutes, this corresponds to a memory volume of one whole year. 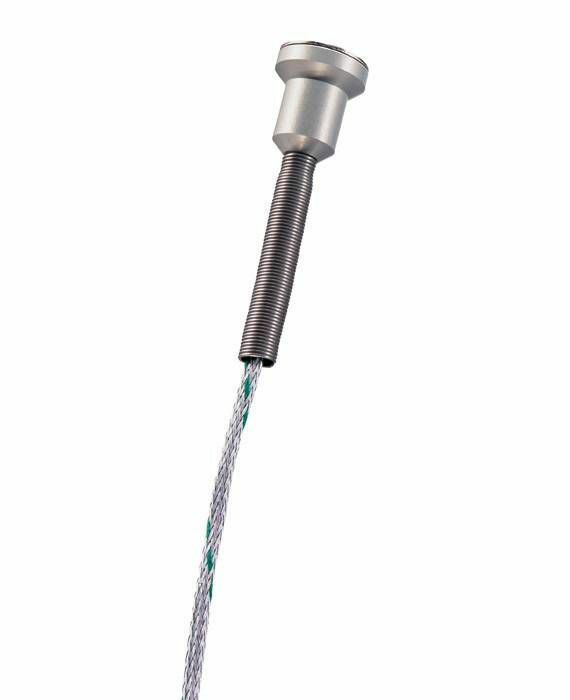 Or to put it differently: a staggering 18 000 000 measurements. 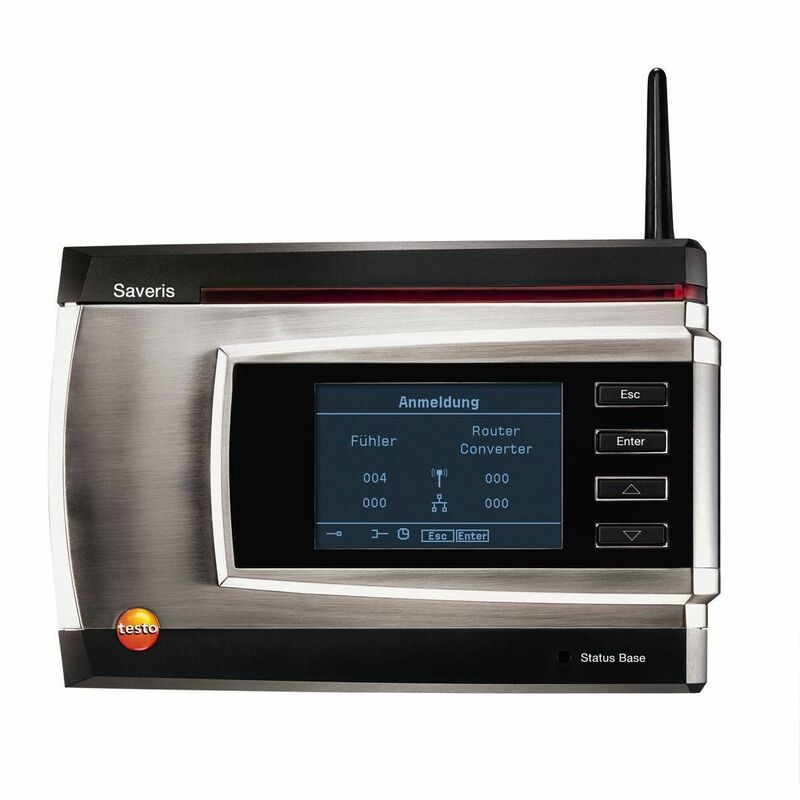 The testo Saveris Base is also equipped with an alarm relay for connecting different types of alarm. 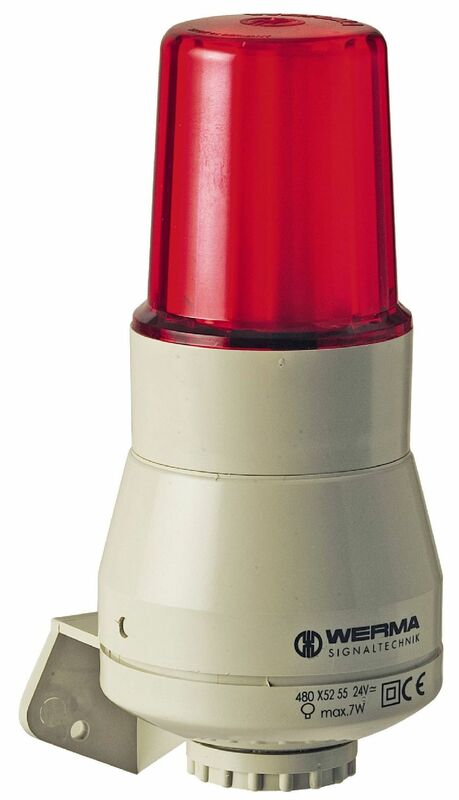 When a threshold is breached, a lamp lights up, for example, or a horn sounds. 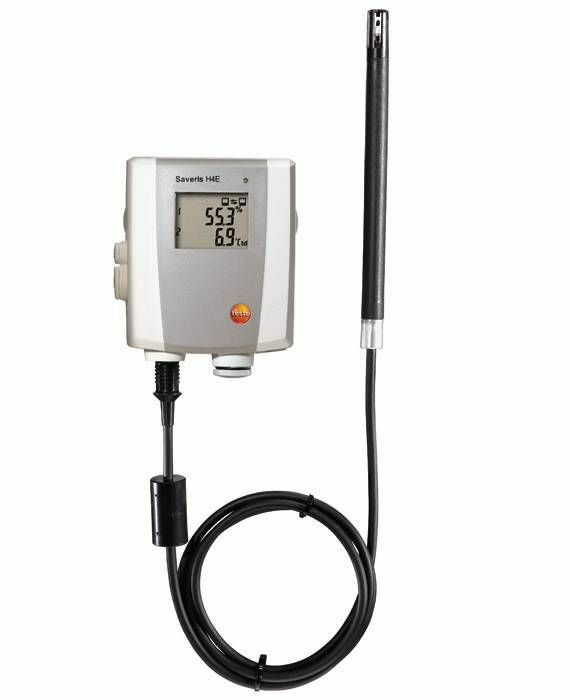 The built-in emergency battery ensures that measuring data cannot be lost – even in the event of a power cut. 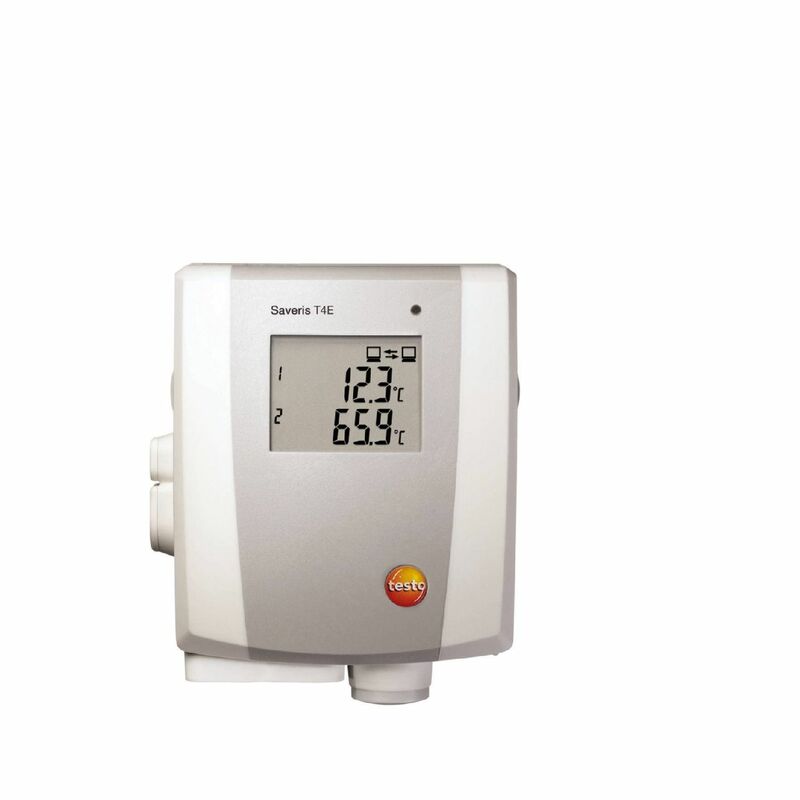 The system data and alarms are always clearly visible on the testo Saveris Base’s display. testo Saveris Base, wireless frequency 868 MHz, table base, wall bracket. 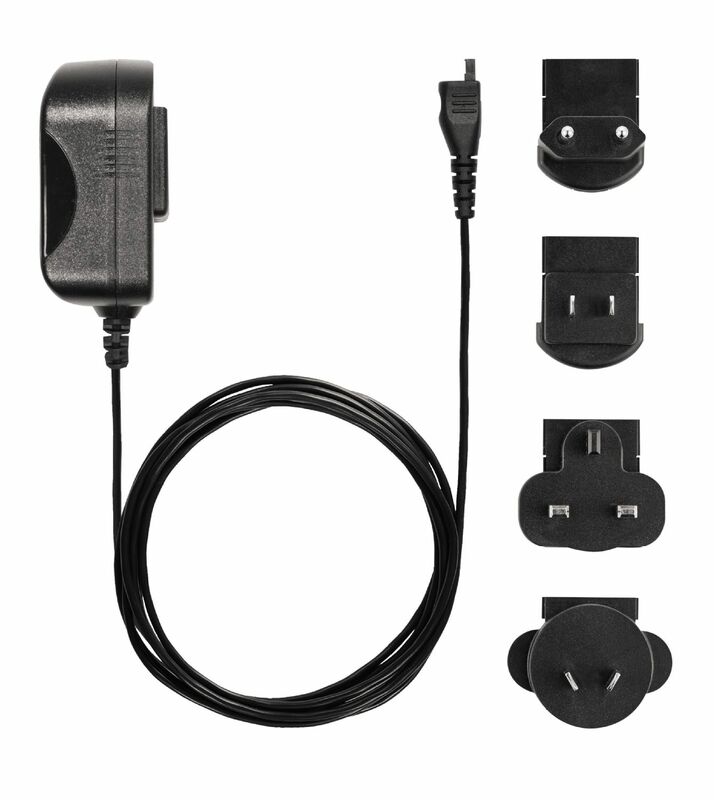 PLEASE NOTE: power adaptor and magnet base antenna NOT included in scope of delivery. 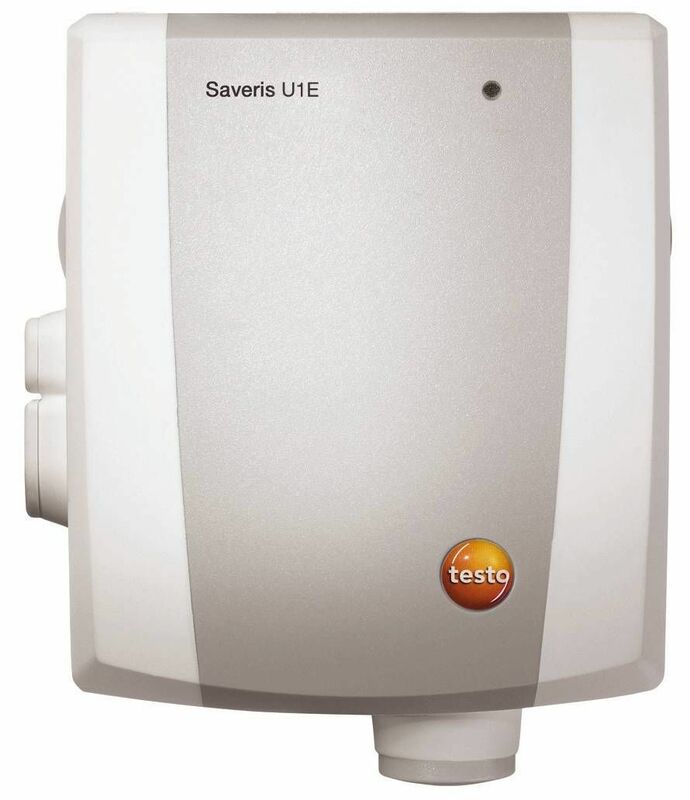 The 1-channel testo Saveris U1 E Ethernet probe / analog coupler allows the inclusion of other measurement parameters in the testo Saveris monitoring system, by integrating all transmitters with standardised current/voltage interfaces. 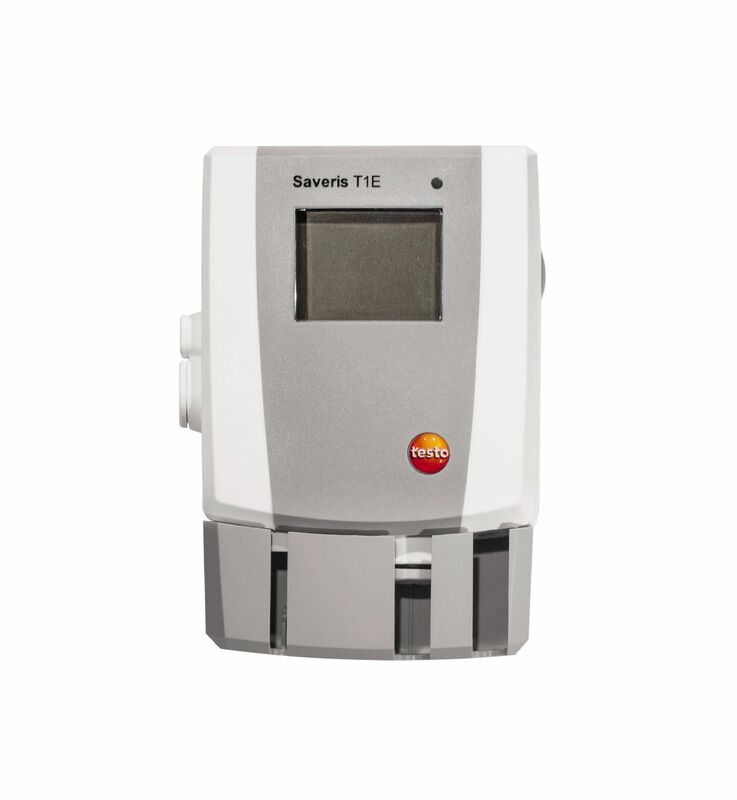 The testo Saveris H1 E Ethernet probe is ideal for monitoring the temperature and relative humidity in environments where high-precision measurement data is required. It continuously records temperature and humidity values and, if required, shows the dewpoint and absolute humidity on the display as well as the temperature and humidity. 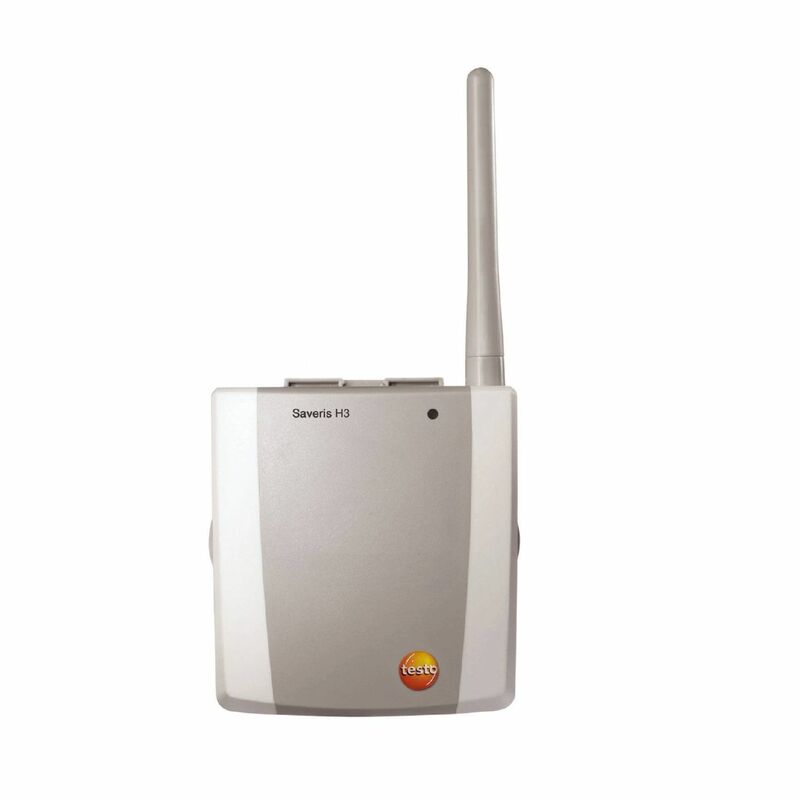 The testo Saveris H4 E Ethernet probe has a connection option for an external humidity/temperature probe and is therefore ideal for monitoring ambient conditions in buildings and warehouses. 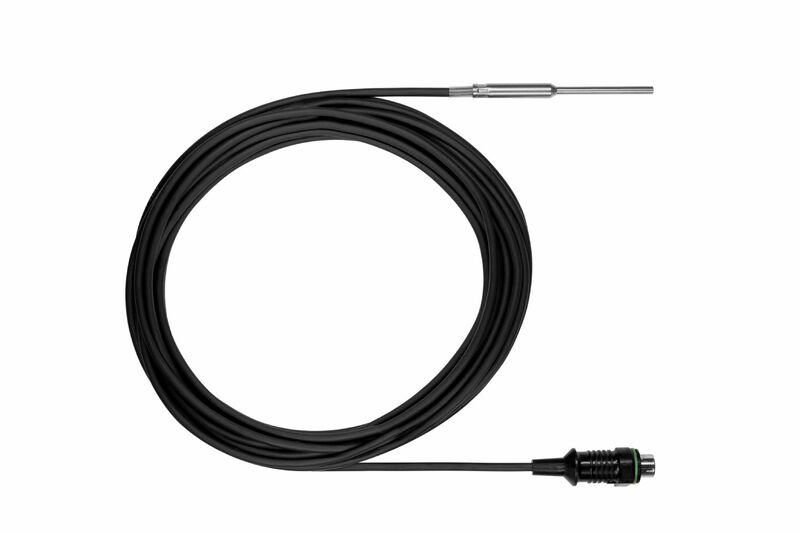 The high-precision testo Saveris Pt E Ethernet probe is equipped with an external connection for Pt100 temperature probes. 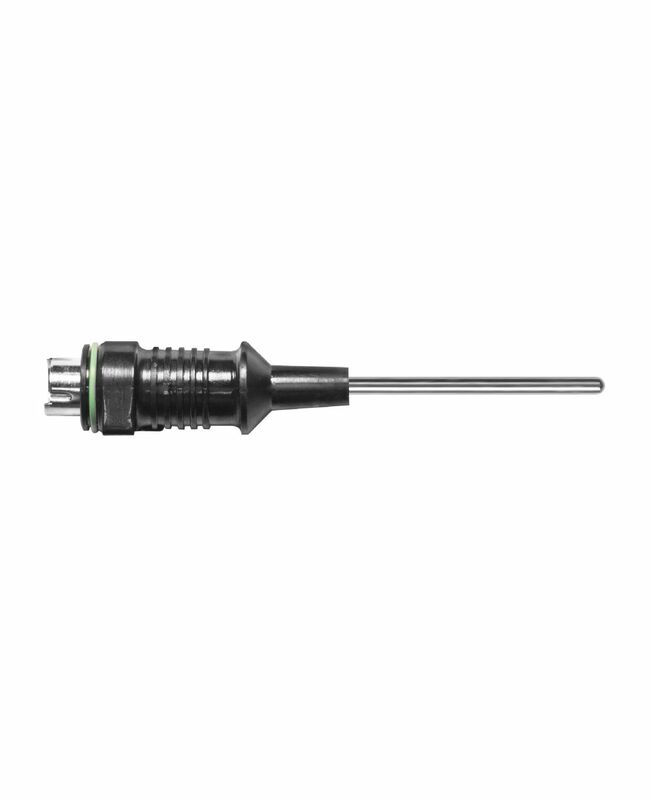 Its high level of measuring accuracy enables it to be used even in critical environments, where there are particular requirements in terms of the measuring technology. 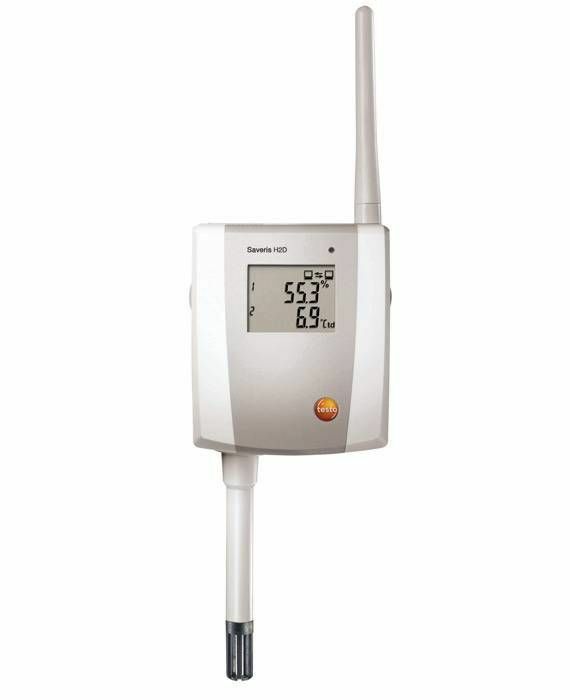 The temperature often has to be monitored and recorded at several points at the same time. 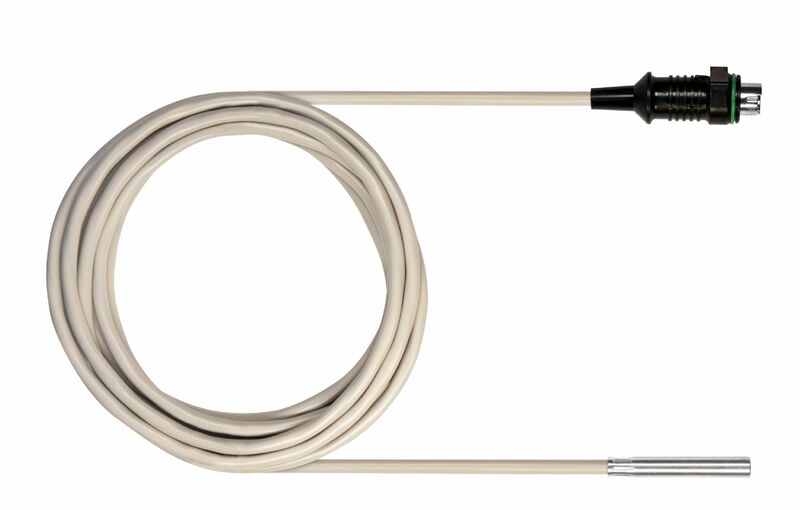 With four connections for external thermocouple probes (TC Type K, Type T, Type J, Type S), the testo Saveris T4 E Ethernet probe is ideally suited for this task. 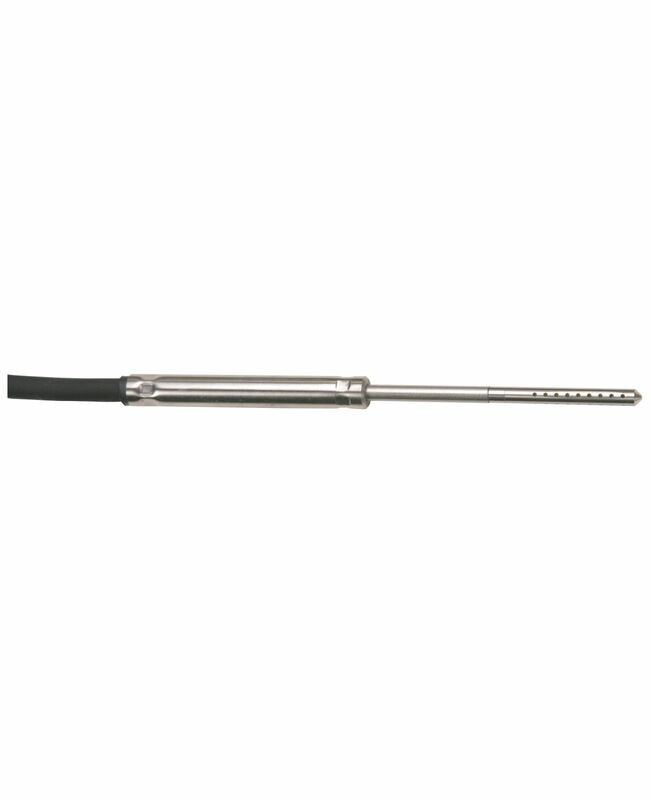 The large measuring range makes the Ethernet probe universally applicable. 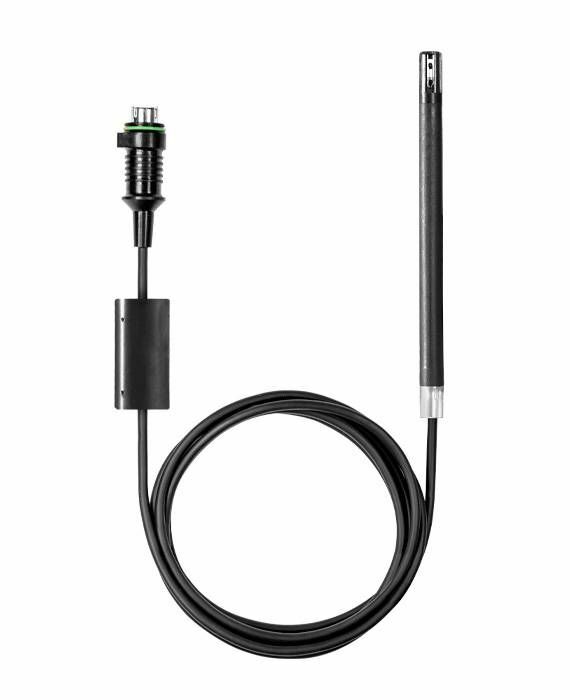 The testo Saveris T2 radio probe is equipped with an internal temperature sensor, a connection option for another external temperature probe (optional) as well as a door contact. 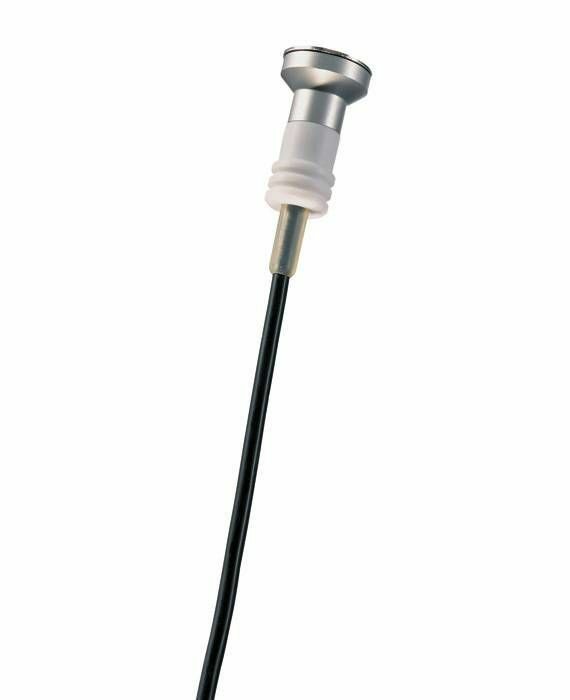 The robust probe is EN 12830-certified and is therefore ideal for monitoring temperatures in the food industry. 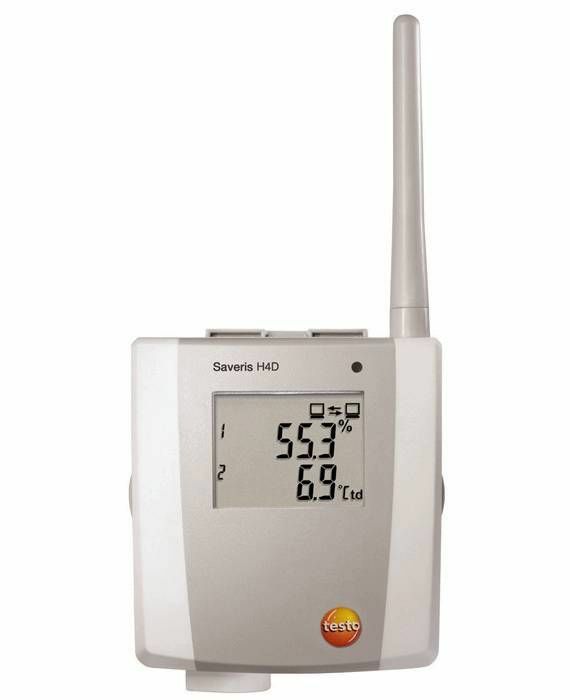 The testo Saveris T1 D radio probe is equipped with an internal temperature sensor. 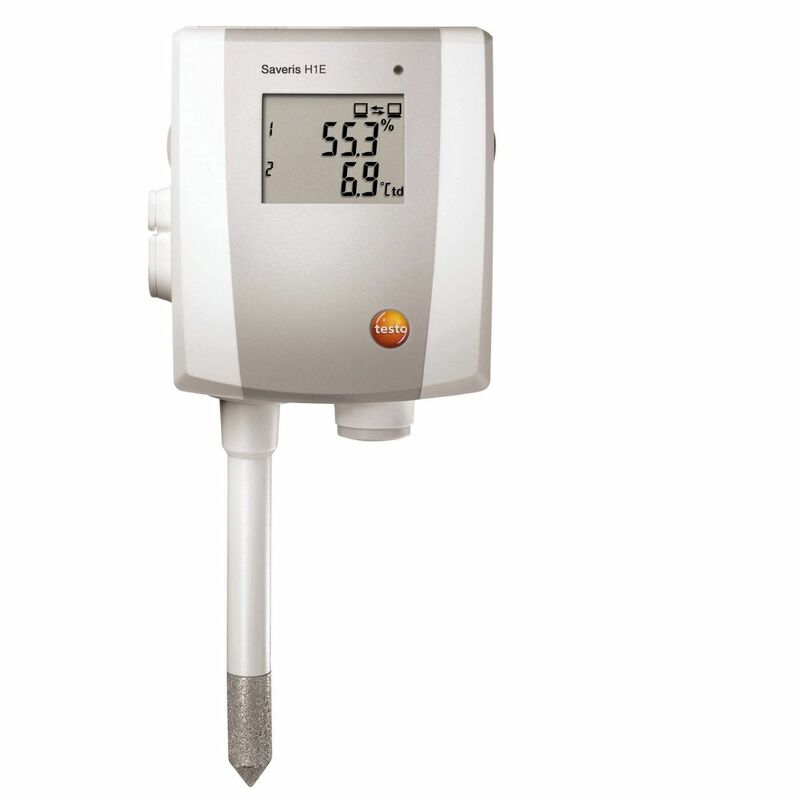 It is EN 12830-compliant and is therefore ideal for monitoring temperatures in the food industry. 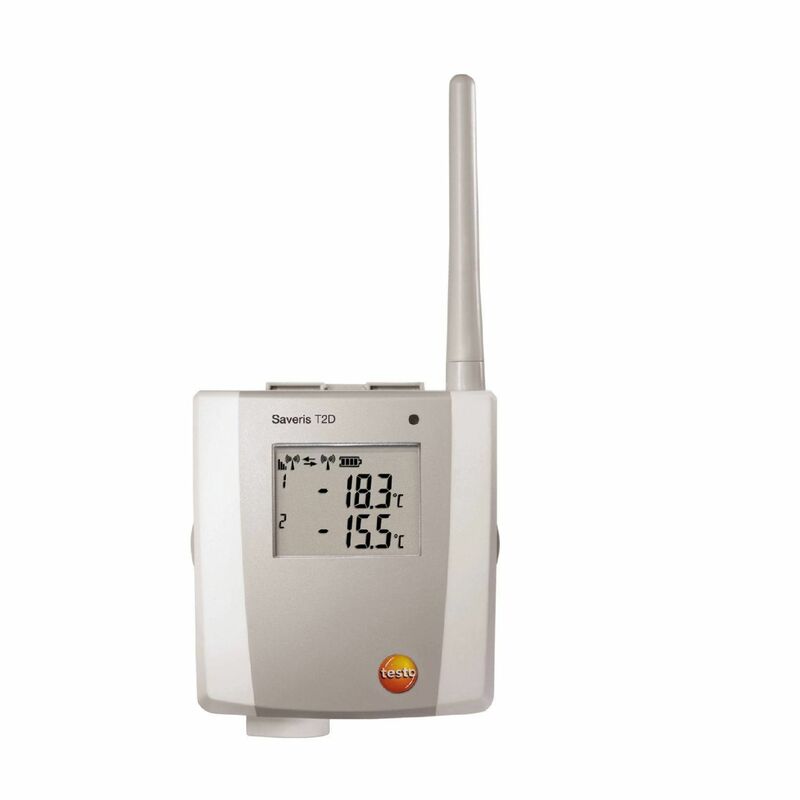 The testo Saveris T2 D radio probe is equipped with an internal temperature sensor, a connection option for another external temperature probe (optional) as well as a door contact. 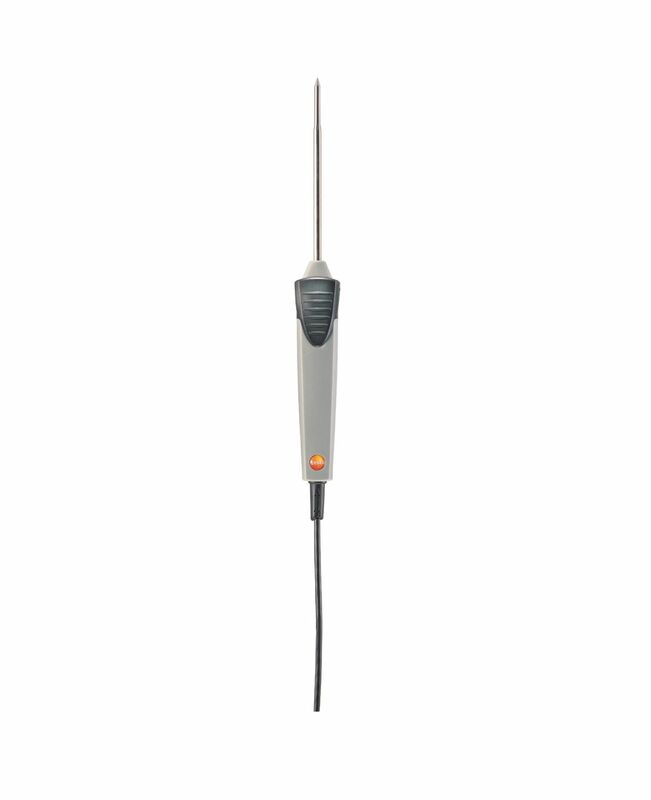 The robust probe is EN 12830-certified and is therefore ideal for monitoring temperatures in the food industry. 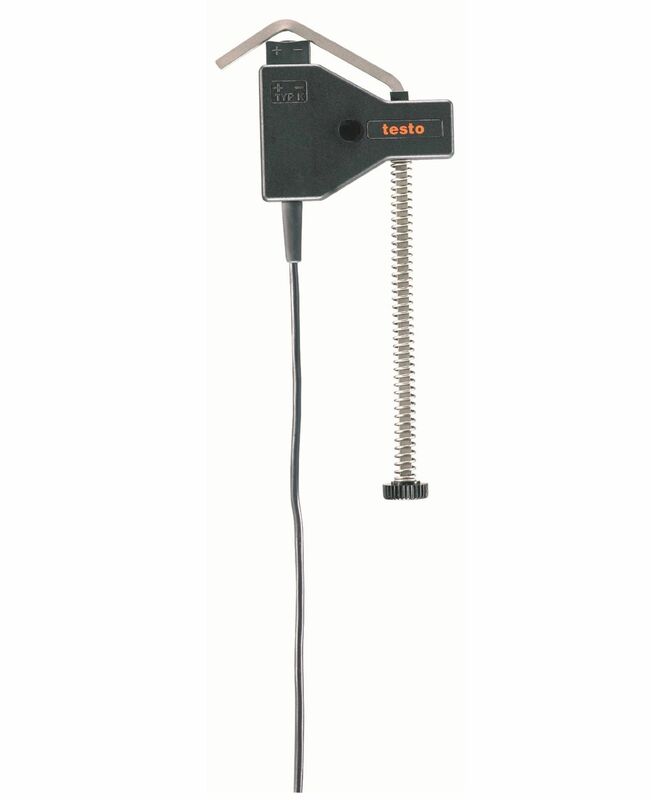 The 1-channel testo Saveris U1 radio probe / analog coupler allows the inclusion of other measurement parameters in the testo Saveris monitoring system, by integrating all transmitters with standardised current/voltage interfaces (e.g. 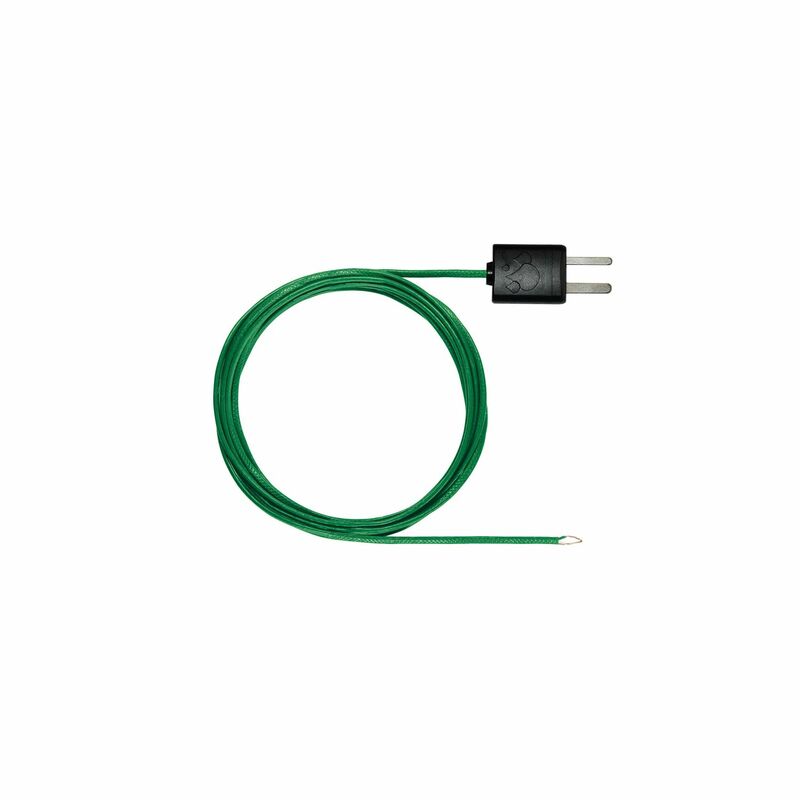 4 to 20 mA or 0 to 10 V). 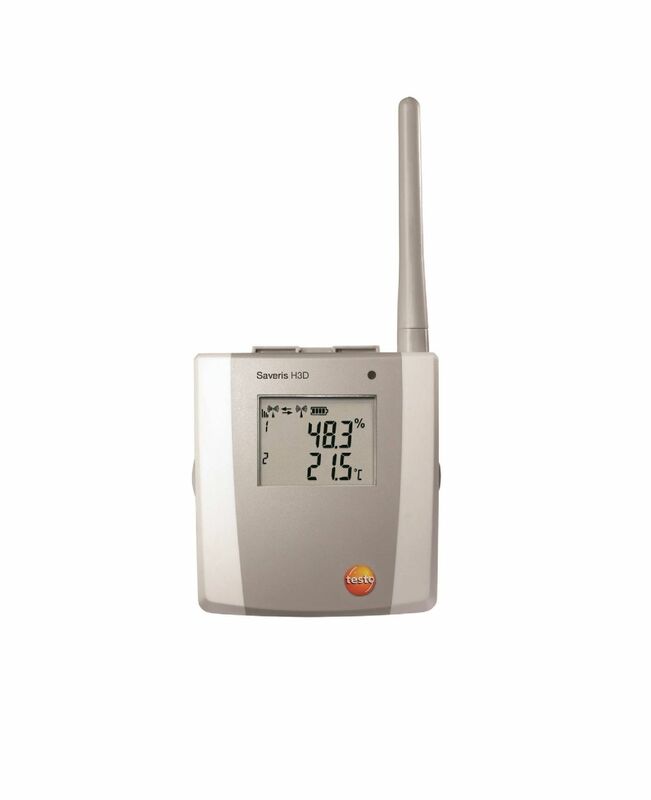 The testo Saveris H3 radio probe is equipped with an internal humidity and temperature probe and is therefore ideal for monitoring warehouse goods that are sensitive to temperature and humidity. 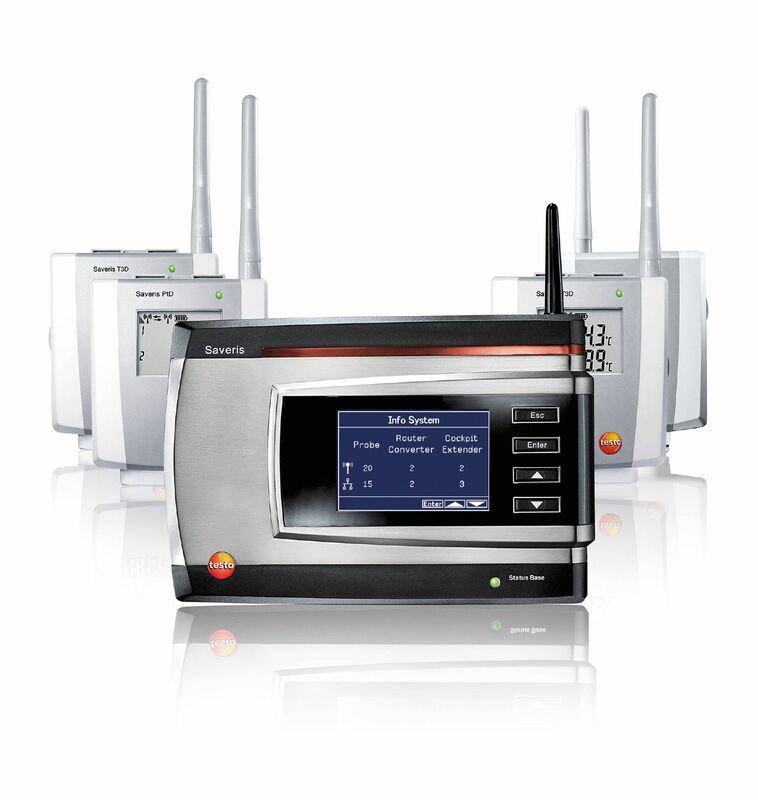 It also monitors the air conditioning in buildings, continuously and reliably. The testo Saveris H4 D radio probe has a connection option for an external humidity/temperature probe and is therefore suitable for monitoring ambient conditions in buildings and warehouses. 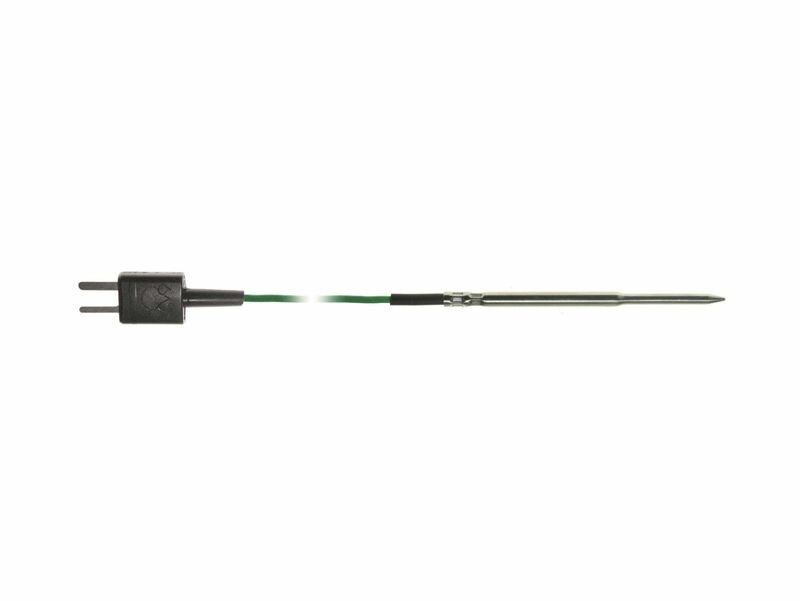 The high-precision testo Saveris Pt D radio probe is equipped with an external Pt100 probe connection. 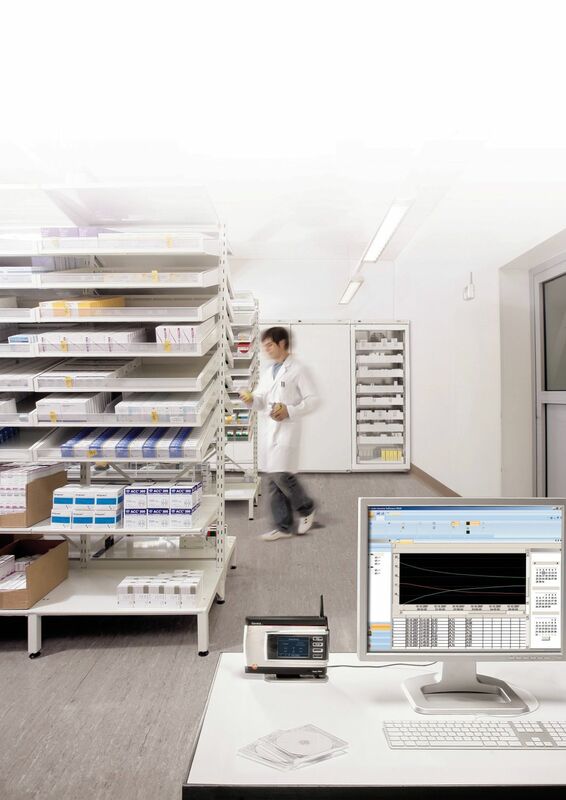 Its high level of measuring accuracy enables it to be used even in critical environments, where there are particular requirements in terms of the measuring technology. 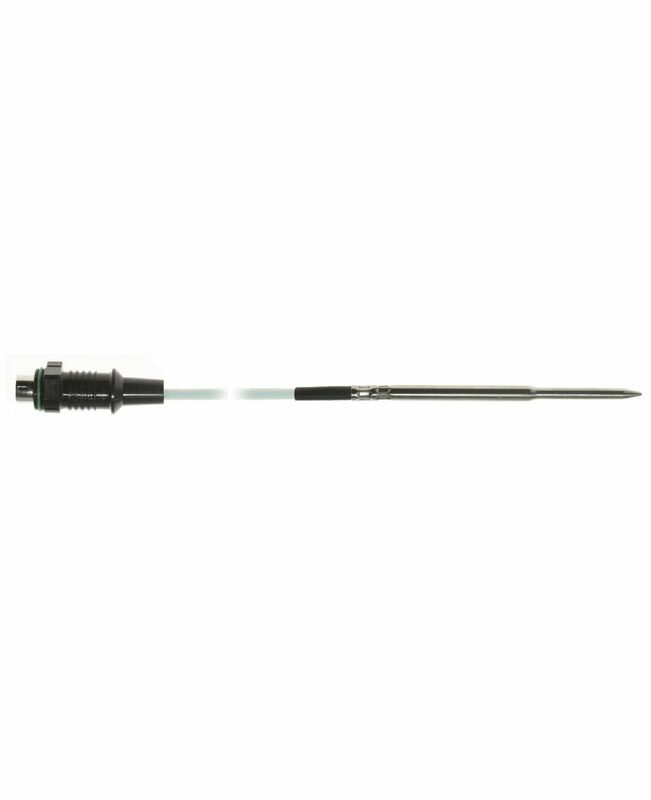 The high-precision testo Saveris Pt radio probe is equipped with an external Pt100 probe connection. 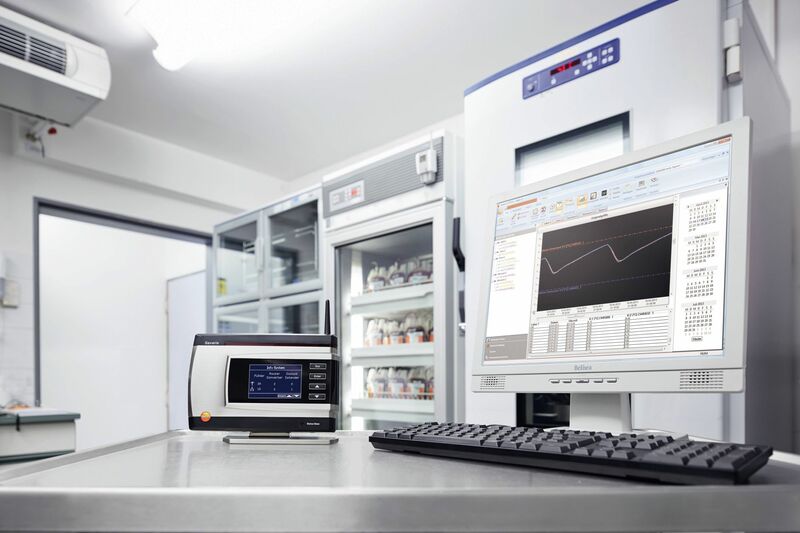 Its high level of measuring accuracy enables it to be used even in critical environments, where there are particular requirements in terms of the measuring technology. 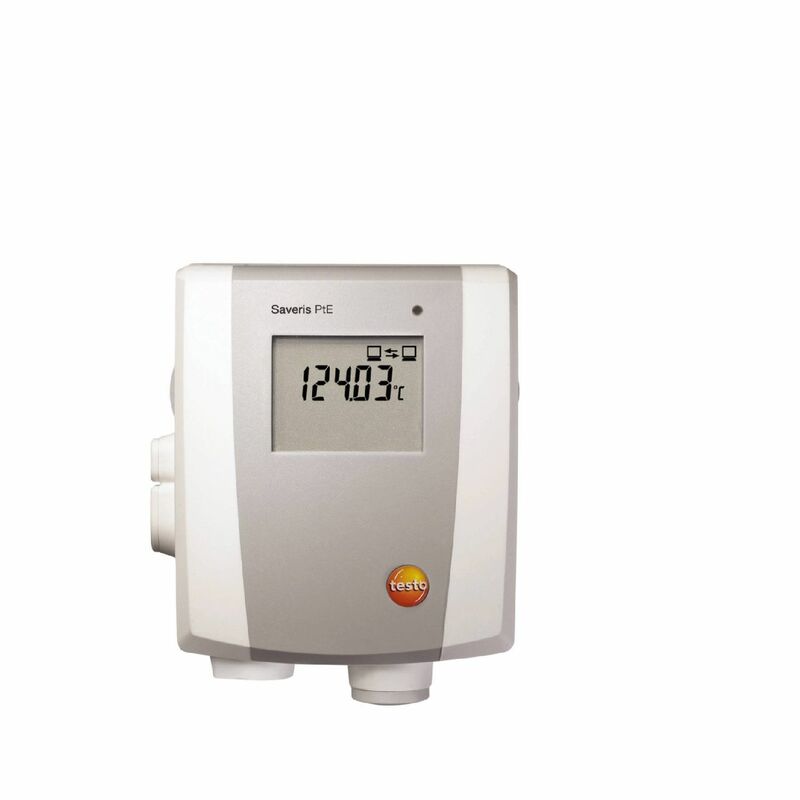 The temperature often has to be monitored and recorded at two points at the same time. 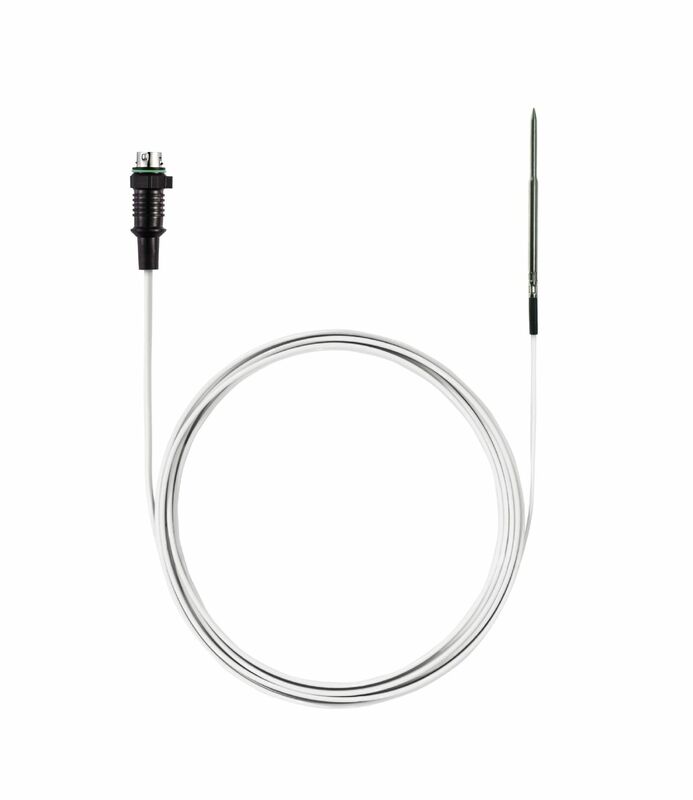 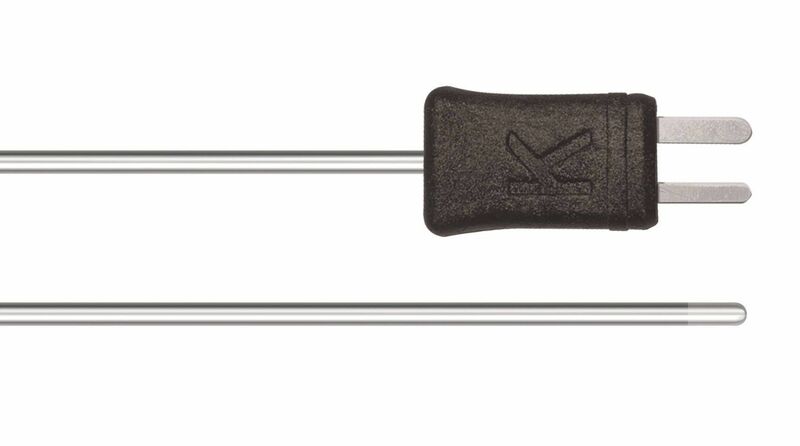 With two connections for external thermocouple probes (TC Type K, Type T, Type J, Type S), the testo Saveris T3 radio probe is ideally suited for this task. 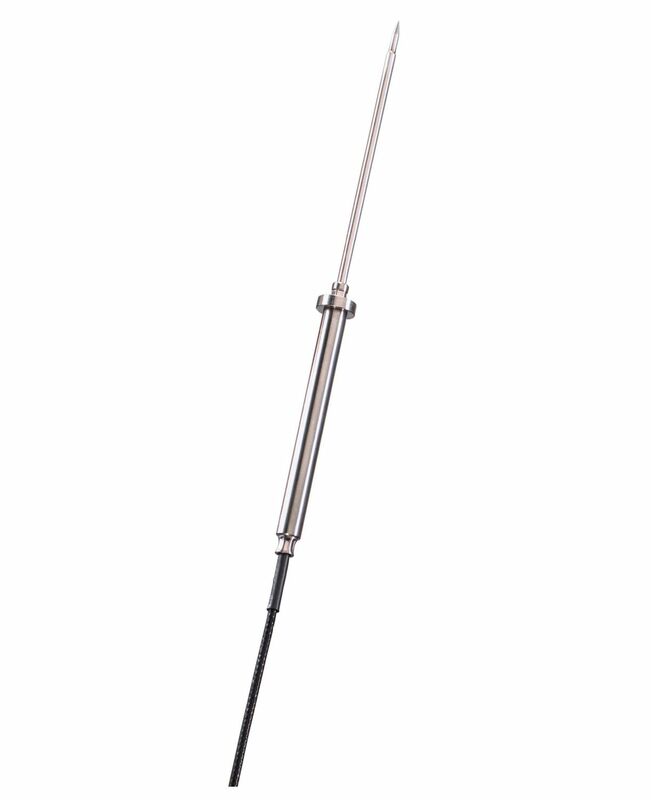 The large measuring range makes the radio probe universally applicable. 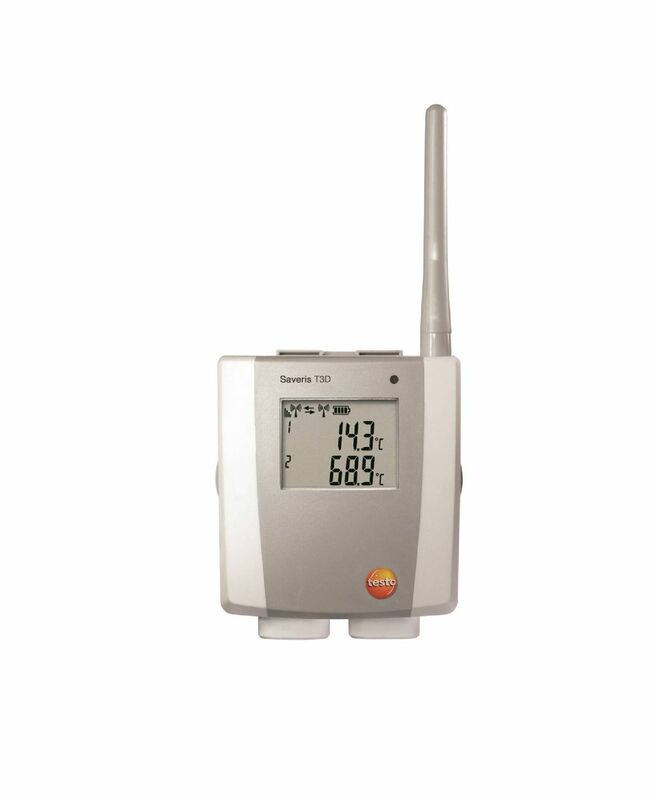 The temperature often has to be monitored and recorded at two points at the same time. 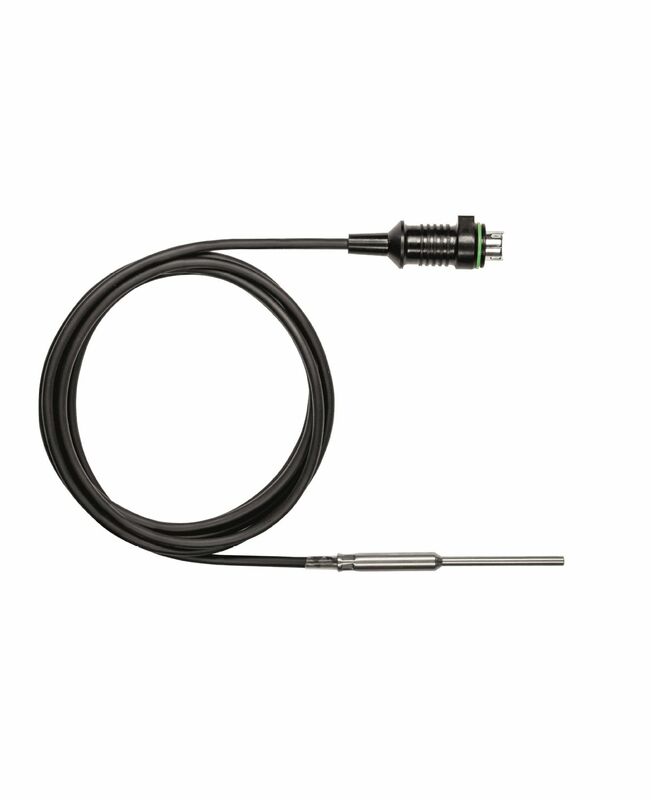 With two connections for external thermocouple probes (TC Type K, Type T, Type J, Type S), the testo Saveris T3 D radio probe is ideally suited for this task. 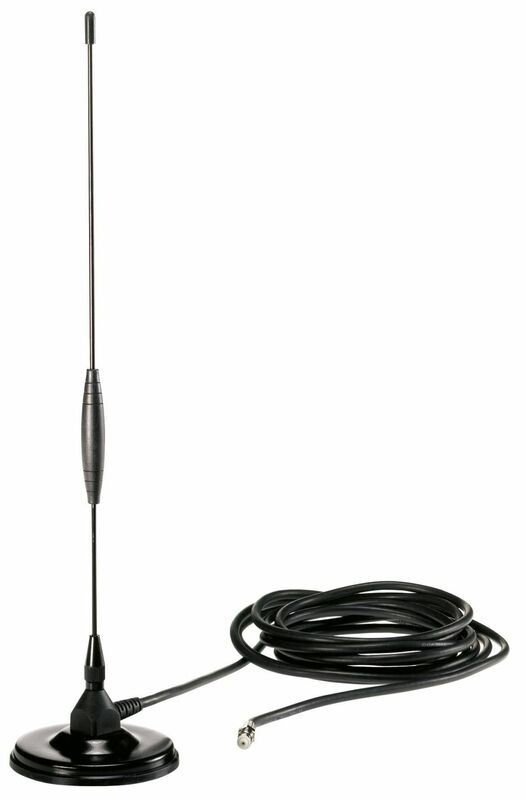 The large measuring range makes the radio probe universally applicable. 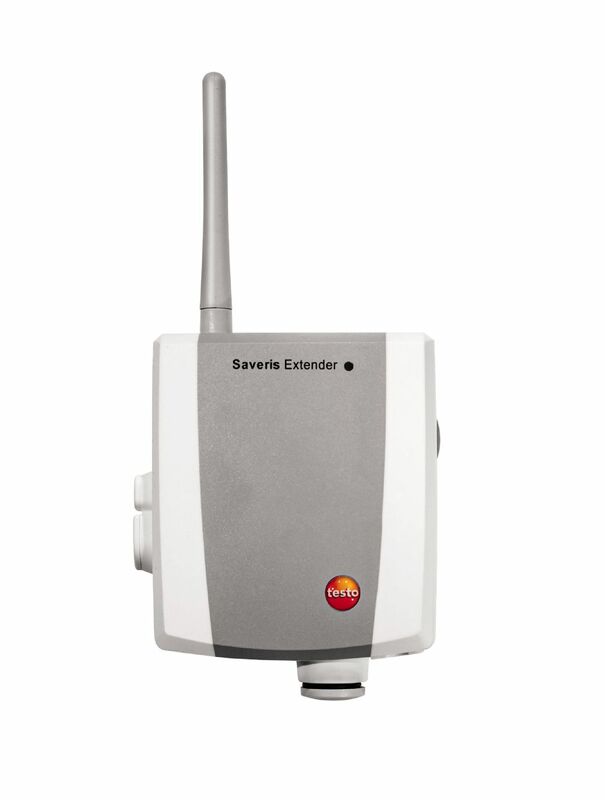 Programming adapter (from mini-DIN to USB) for base, Ethernet probe, converter and extender for the configuration of IP addresses and for the adjustment of Saveris probes using the Saveris adjustment software. By connecting the antenna with magnetic foot, on the testo Saveris base with GSM module, it is possible to send alarm messages via SMS and to receive alarm acknowledgements. 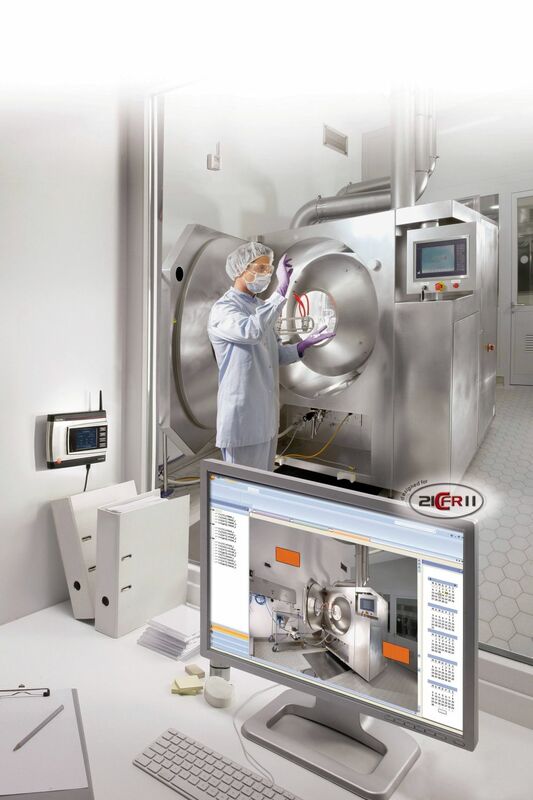 The software version 21 CFR Part 11 fulfils the requirements of the FDA’s 21 CFR Part 11 and is thus validatable. 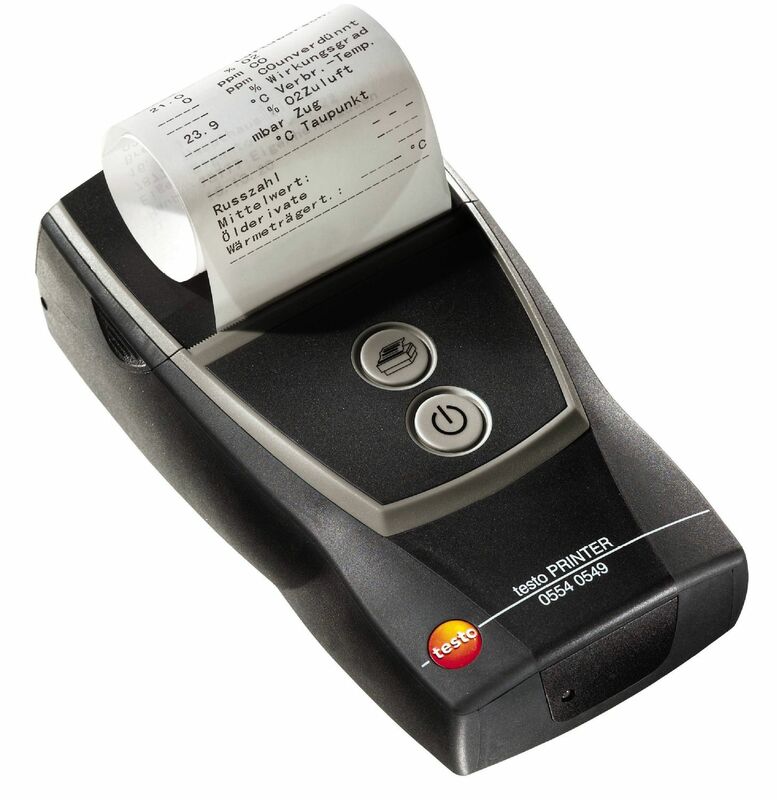 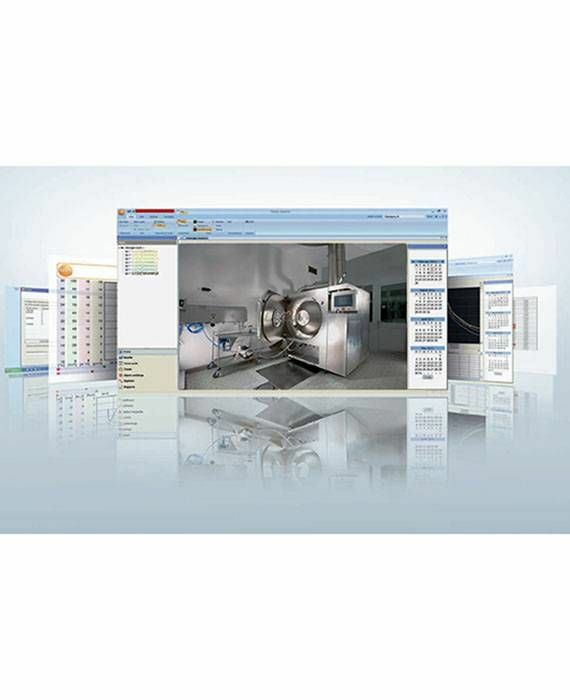 The software offers interesting additional functions beyond the attractive basic functions of the Professional version. 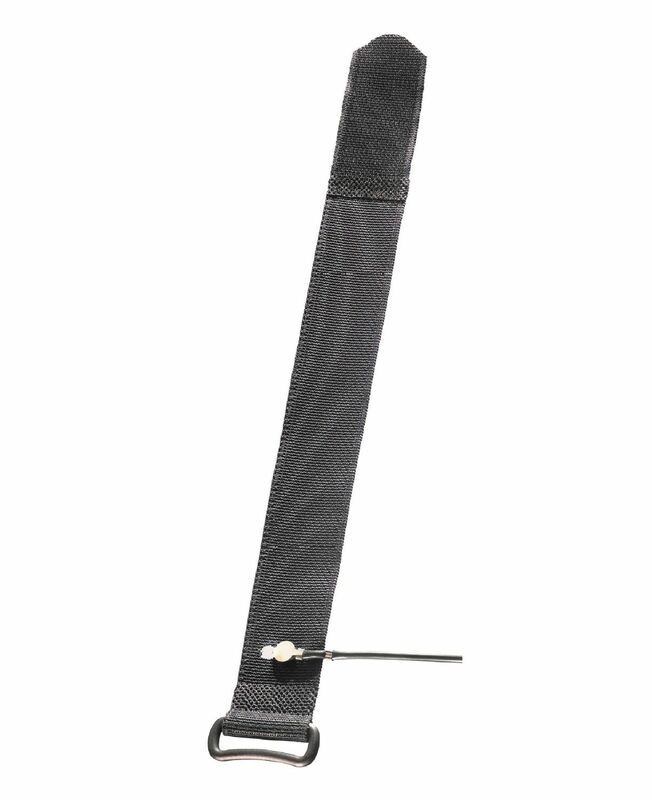 The Saveris protective housing protects Saveris radio probes effectively from adverse ambient conditions. 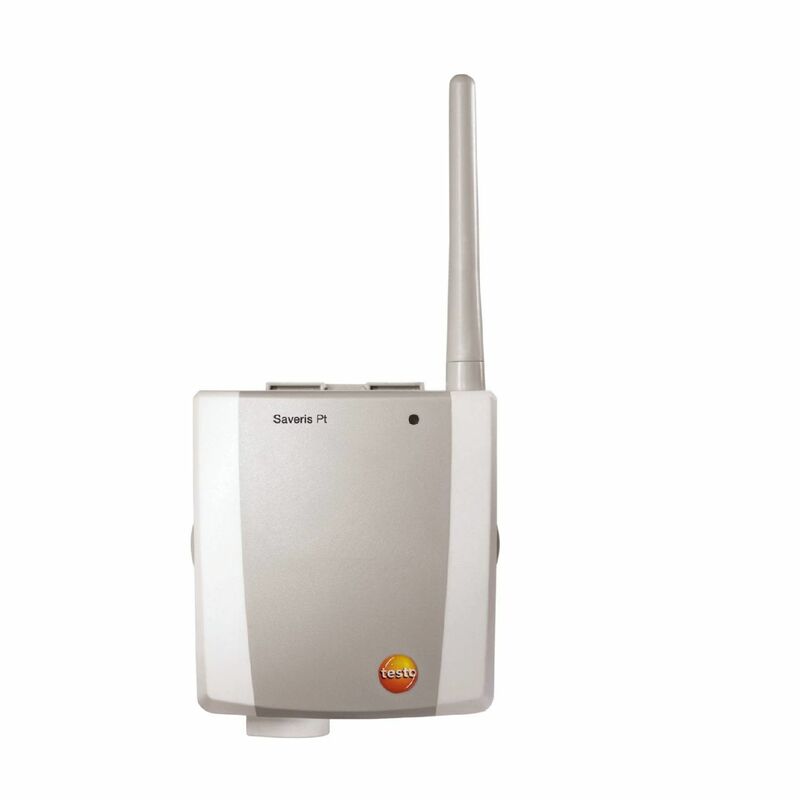 Alarm module (visual + acoustic), can be connected to base alarm relay.  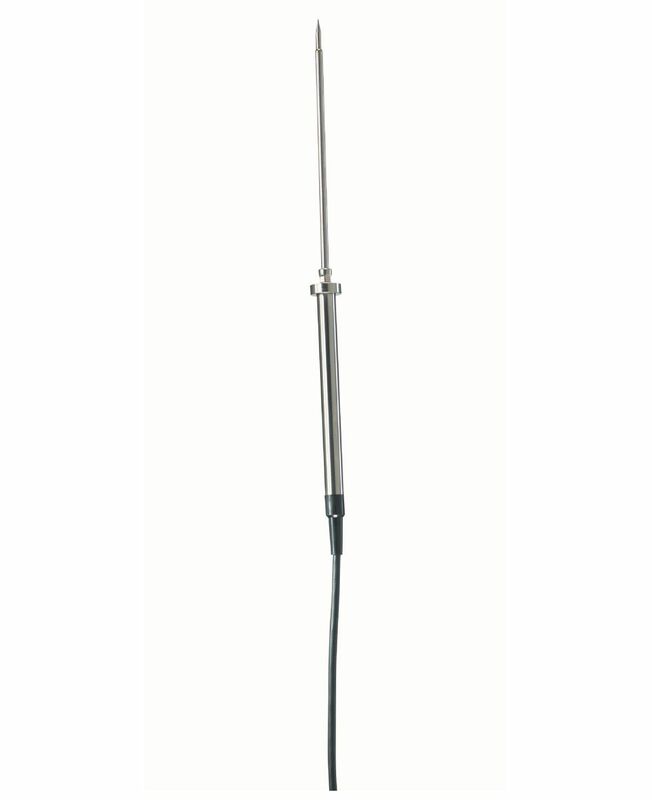 Ø 70 × 164 mm, 24 V AC/DC/320 mA, steady red light, continuous tone: Buzzer approx. 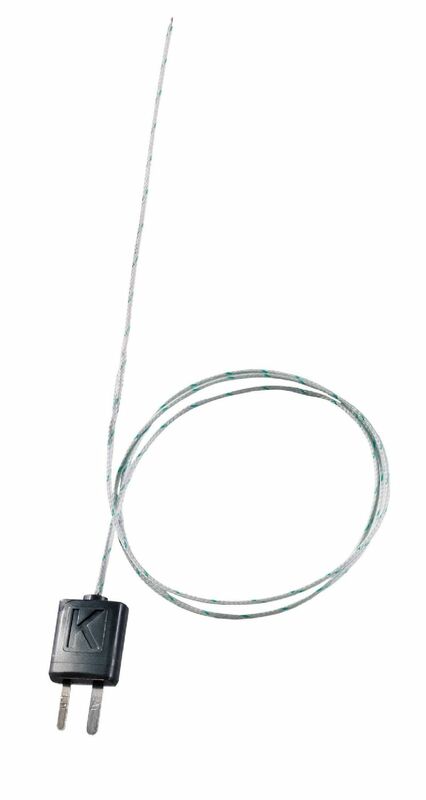 2.4 kHz (mains unit 0554 1749 required). 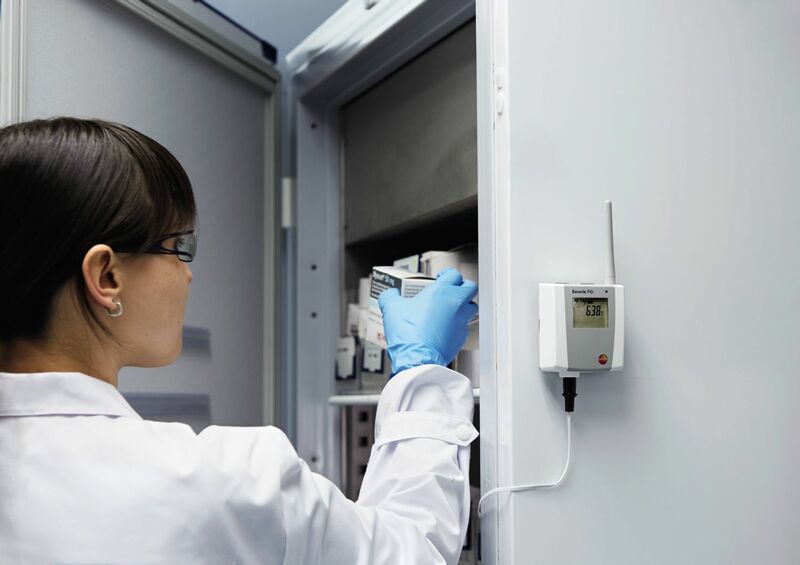 The transport of temperature or moisture sensitive goods is a highly delicate undertaking. 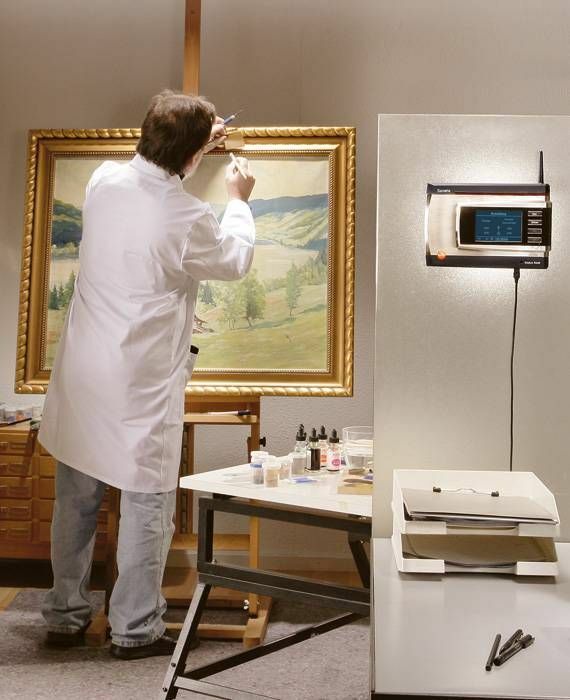 That’s why climate conditions have to be constantly monitored. 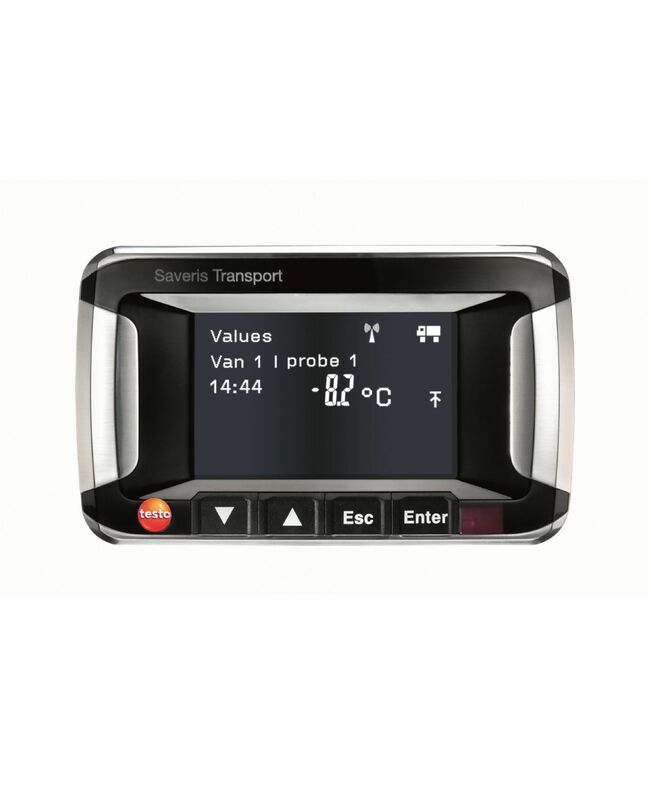 The testo Saveris Cockpit Unit allows the driver to keep a sharp eye on the measurement data obtained from the cargo area during transport and triggers an alarm when a threshold is breached. 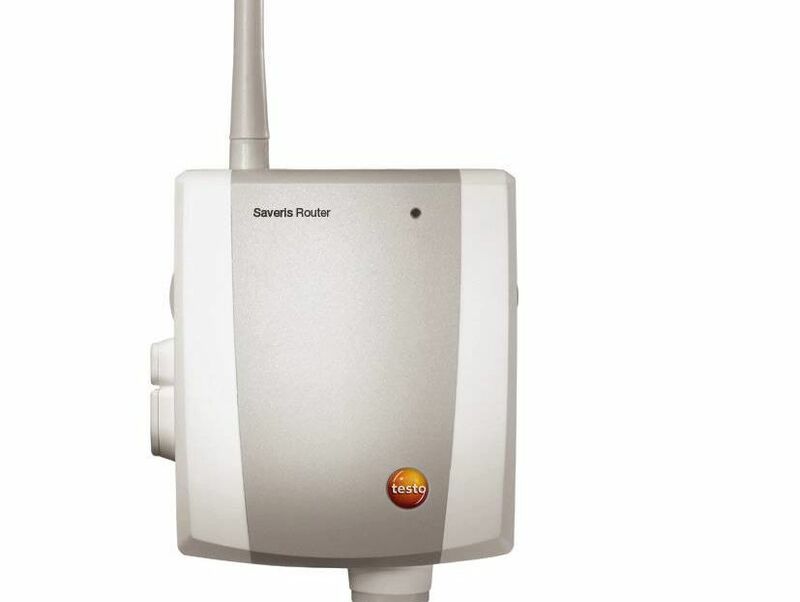 By connecting a testo Saveris extender to an Ethernet jack, the signal of a radio probe, used either stationary or mobile, can be converted into an Ethernet signal. 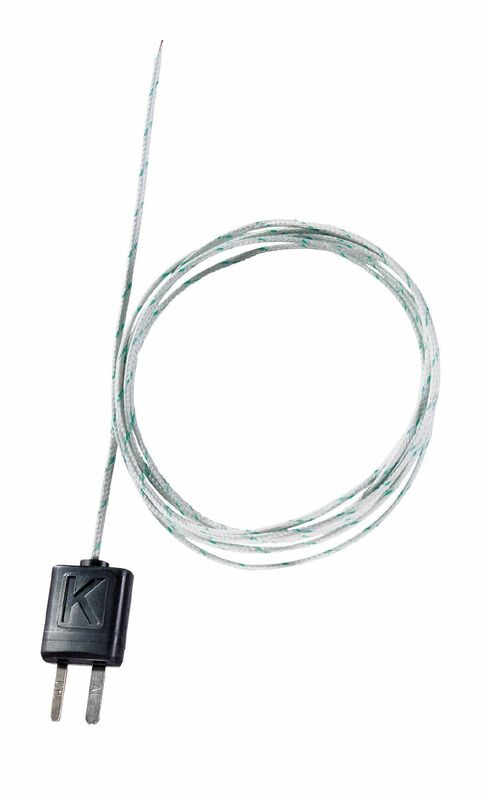 This combines the flexible connection of the radio probe with the use of the existing Ethernet even over long transmission paths. 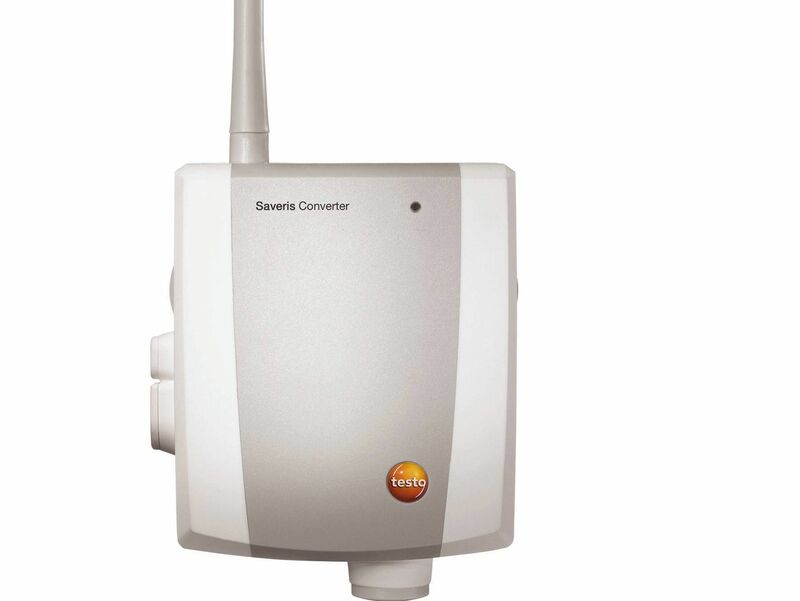 By connecting a testo Saveris converter to an Ethernet jack, the signal of a radio probe can be converted into an Ethernet signal. 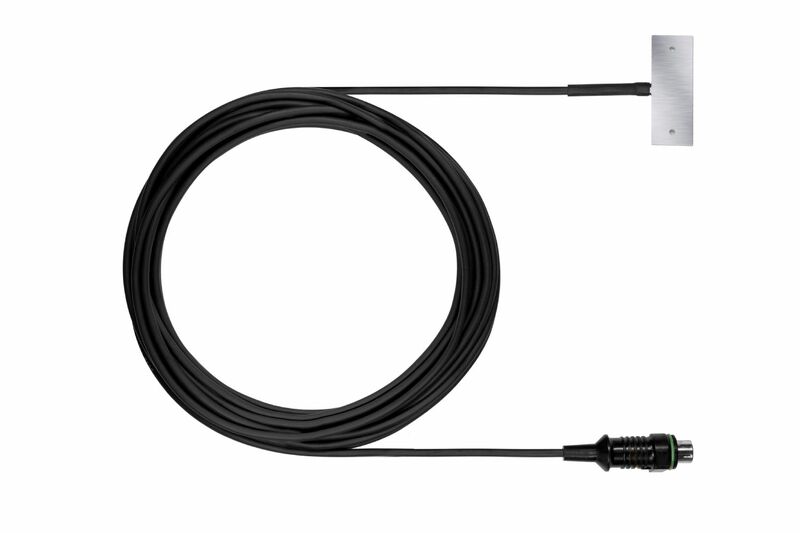 This combines the flexible connection of the radio probe with the use of the existing Ethernet even over long transmission paths.